When I was a kid I saw this dude on T.V. named Arthur Blessitt who carried a huge cross on his back around the world. Although I wasn’t a believer for many years after that, I always remembered two things about it, the cross of Christ and Mr. Blessitt’s zeal for the gospel. I get it now. I understand what it’s like to be touch by Christ and want everyone else to have what you’ve found. For that reason I asked a good friend to make me a huge cross that I could walk around town with. I wanted a conversation piece for those who might be struggling with difficult situations in life and those who may have burdens that are way too heavy for them to carry on their own. I also wanted to encourage other Christians when they see me to not be ashamed of the gospel either. God can give anyone boldness, we just have to ask for it. So if you see a guy walking around the Texoma area carrying a huge cross, stop for a moment and come talk with me about Jesus. I’d love to tell you my story and I’d love to hear yours as well. 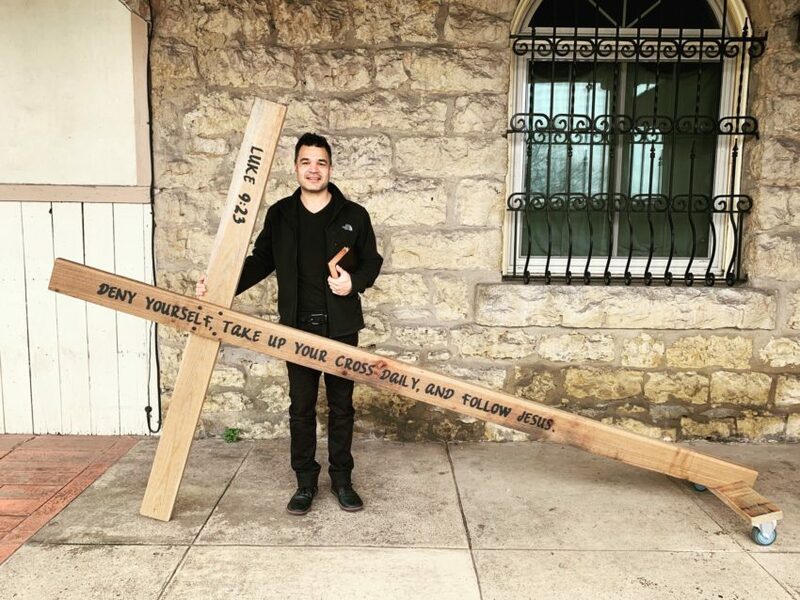 And if you are a Christian and you hear someone else mention some nut job with a huge cross on his back walking in Downtown Denison, it might give you an opportunity to make your stand for Christ and tell the mockers that you take up your cross daily as well and follow Jesus.